Eagle-eyed Londoners will have noticed that an increasingly large number of new restaurants in London are branches, spin-offs and extensions of existing restaurants. That is no accident – experienced operators and proven ‘concepts’ are easier to stomach for commercial landlords, investors, venture capitalists and other risk-averse commercial partners. Xu is a case in-point – this higher-end spin-off of street food veterans Bao is backed by JKS, the restaurant group and investors behind Bao’s Soho and Fitzrovia restaurants (although JKS’ other success stories, such as Lyle’s and Hoppers, shows it can take a few risks too). Indeed, it’s unlikely Xu would be located on such prime real estate, adjacent to the heart of the West End, or have such a lovely interior if it wasn’t for the JKS’ comparatively deep pockets. 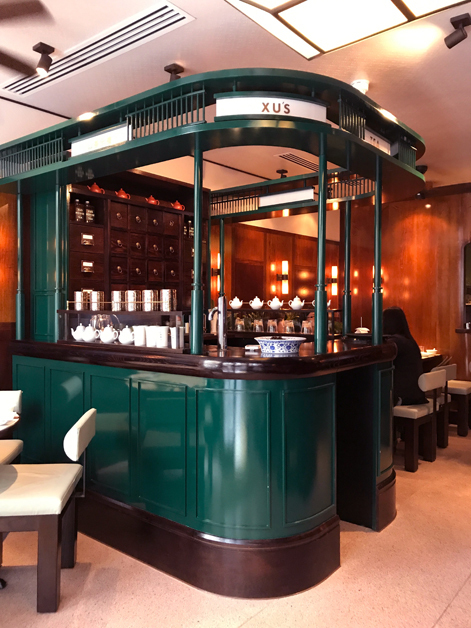 The dark wooden panels and pine green interior are meant to evoke a bygone colonial-era Taipei. Although it’s a tad too ahistorical to fit that time period, it’s an undeniably handsome space. The neat touches, such as the underseat drawers at some tables for tucking away bags and coats, will almost certainly distract you from noticing how comparatively small it is. With the almost total implosion of Leong’s Legends, there are are precious few standard bearers for traditional Taiwanese food in central London. It’s important to note that Xu doesn’t really try to take up this mantle. It instead takes the general idea of non-gua bao dishes, one of the best and most under appreciated things about Bao’s menus, and innovates further. There’s a Chinese watercolour-style mural of Taiwanese mountains on the upper floor. One of the many things that I admire about Bao is their interesting selection of non-alcoholic drinks, a trend that extends to Xu. The 500ml bottle of House cold-brew iced tea easily matches the cold-brews I’ve had in Taiwan itself – crisp and refreshing with a gentle honey-like sweetness and a clear aftertaste. *This* is an iced tea. All the Chinese beef jerky I’ve had previously has been comparable in taste and toughness to the mass-produced stuff that comes out of the US. 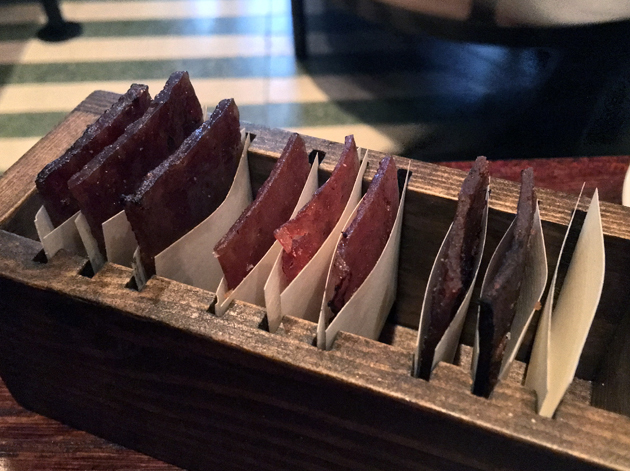 Xu’s jerky is a different beast altogether – and I’m not just talking about the After Eights-style presentation. Every slice was soft, pliable and meaty with a sweetness that ranged from tangy to lightly malty with my favourite packing a molasses-like brown sugar punch. There’s jerky, then there’s this jerky. The relishes on the side were hardly necessary. A beefy After Eight, ma’am? Quite a few Chinese dishes have superstitious names and appearances linked to prosperity and money, so it’s no surprise to see a dish called ‘Gold Coin’ on the menu. 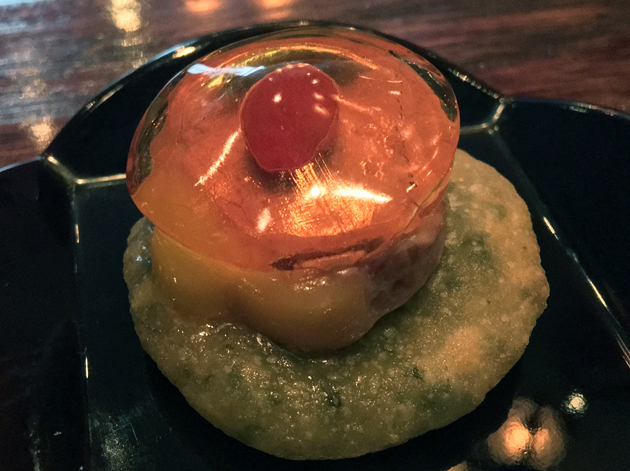 An amuse bouche-sized morsel, a chewy and moreish miniature Taiwanese pancake came topped with creamy smooth foie gras and a coin-sized jelly disc tangy with the taste of shaoxing wine. 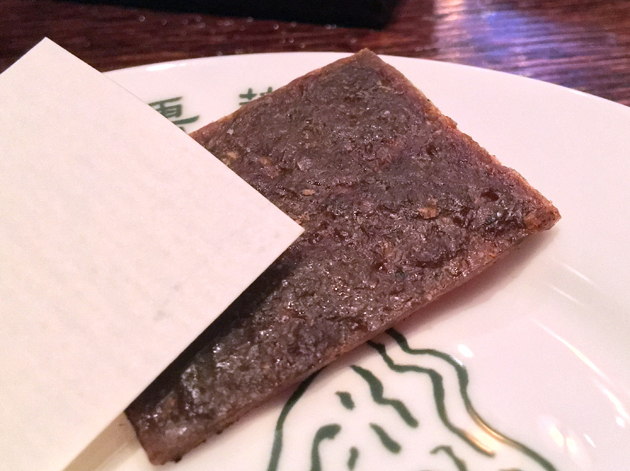 The pate element didn’t really need to be foie – the small size meant its qualities were transient and could easily have been replicated by another meat spread – but this was still a neat little reinterpretation of some classic Chinese dishes and ingredients. 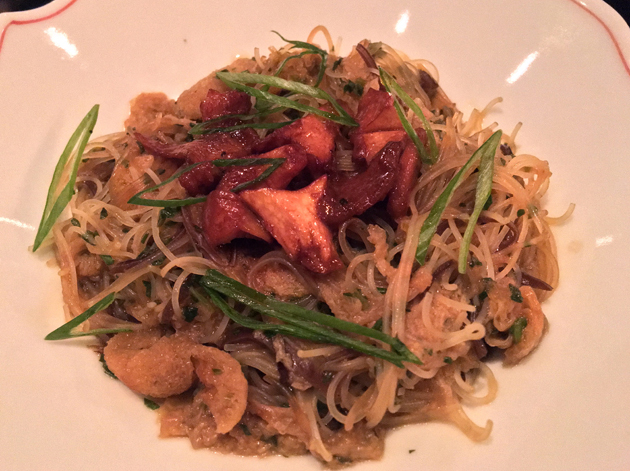 An artful plate of chilled beef tendons was vaguely reminiscent of the classic Cantonese dish of chilled pork and jellyfish. Despite being wafer thin, the beef tendons were quiveringly unctuous. This gelatinous fattiness was made even better by the zingy chilli- and coriander-laced sauce that left behind a tingly reverie on my lips. One day I’ll get to go back to Taiwan and climb more mountains. 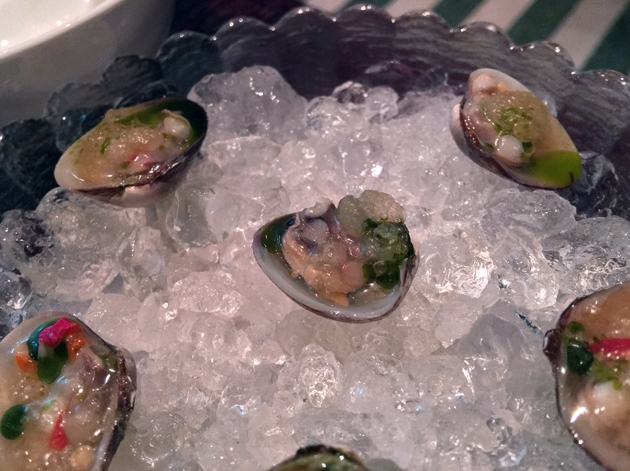 Small, chilled clams arrived on a bed of ice and were dressed in a brisk, zingy dressing. All of this was hard to appreciate though, given their minuscule size. 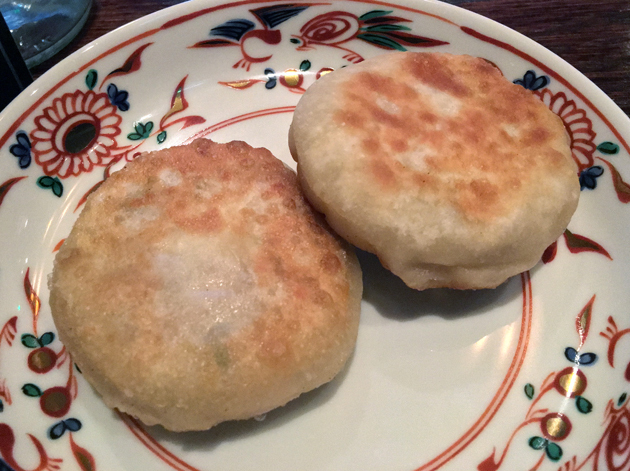 Miniature flat-ish buns filled with pork were reminiscent of Xi’an-style buns. The pastry exterior had a crisp initial bite, followed by a light and wispy substrata holding a juicy porky interior laced with chives. It was scrumptious enough on its own – combined with the lightly spiced chilli and vinegar dipping sauce on the side, it was delightful. It’s hard to take photos when you’re also trying to stop meat juices from squirting anywhere but into your mouth. 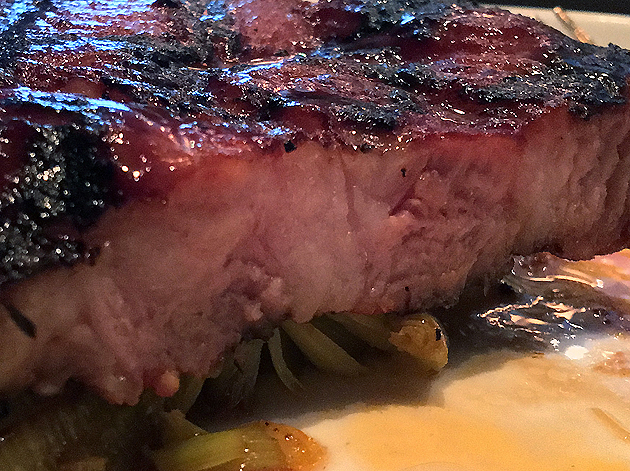 Along with the clams, the only dud dish of this first meal was the char siu iberico pork. Although consistently tender throughout – not always a given with pork – it wasn’t as fatty and characterful as I would’ve expected. The marinade and level of grilling didn’t impart the pork with the level of sweet smokiness as I would’ve expected either. Disappointing. Although advertised as ‘yams’, this sweet, starchy and creamy puree tasted more like taro to me. Either way, its already comforting qualities were further enhanced by an umami dollop of XO sauce. It’s rare to see a side dish that’s so good, it comes so close to eclipsing the mains. 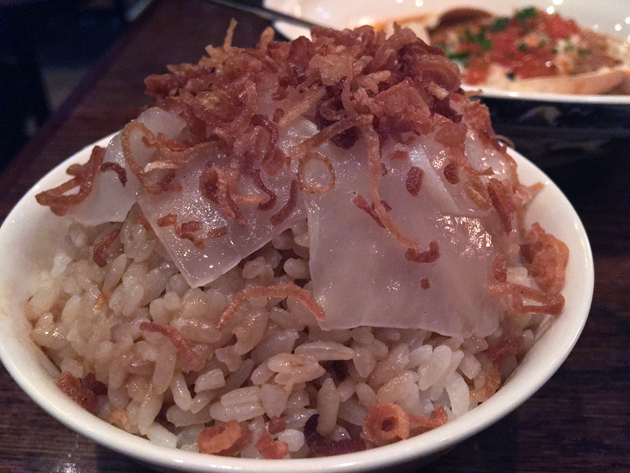 Although the beef fat rice was probably one dish too far for my bulging belly, I don’t regret it one bit. Soft and fluffy small-grained rice along with a few bits of jerky-like fat and meat seemed to have been steeped in beef dripping, wrapped in lotus leaves and then steamed. Despite most of this dish apparently consisting of carbs rather than protein, the unctuous meatiness was nonetheless deeply satisfying. I wasn’t a fan of the sparkling House iced tea at first. 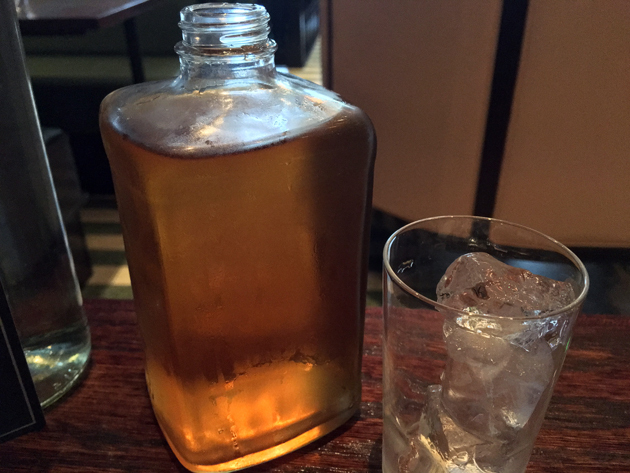 Initially, it seemed like little more than a fizzy and somewhat watered down version of the far superior iced tea from my first visit apart from an extra hint of sweetness. It took on a beguiling hit of smokiness though when taken after certain dishes, such as the shou pa chicken, so it ended up shimming into my affections. The one thing in a wine glass that I can drink. 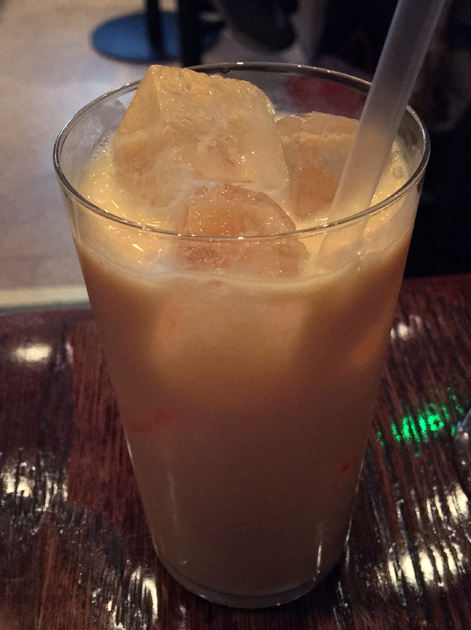 The papaya milk could arguably have been truer to the fruit with a more pronounced musky sweetness. Having said that, this was still a perfectly refreshing and pleasing drink. 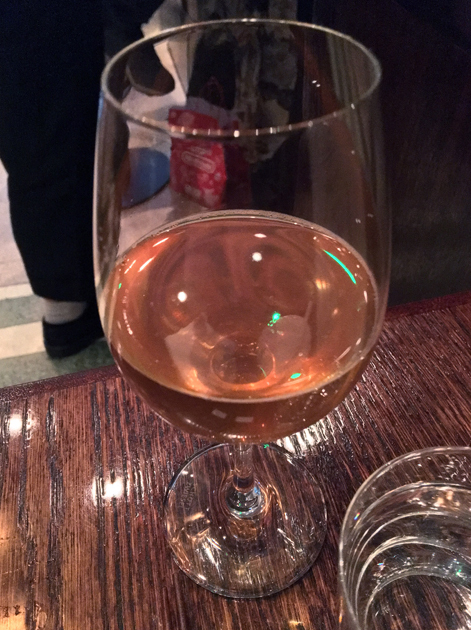 I can’t argue with its precision either – the balance between crisp milkiness and fruity sweetness was deliberate and exact. 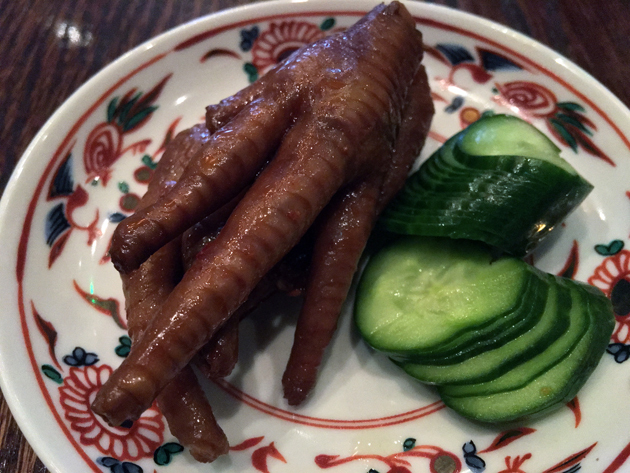 Even by the standards of this dim sum staple, the chicken feet were exceptionally slippery and took a lot of grappling to get into my mouth. It wasn’t really worth the effort though. It was far from bad with the supple and wrinkly skin tinged with umami and an occasional subtle hint of spice. It just wasn’t that different from the other well-executed versions of this dish available elsewhere. I wasn’t expecting much from the taro dumplings which probably amplified their knockout effect. The lightly doughy exterior was sweet and starchy with a gently springy and yielding bite. This masterclass in texture came filled with a meaty dollop of pork, its juices mixing wonderfully with the zingy sauce. Just when I thought I had seen it all in the world of dumplings, this beauty comes along and sweeps me off my feet. You can just make out the dimpled, almost translucent surface. 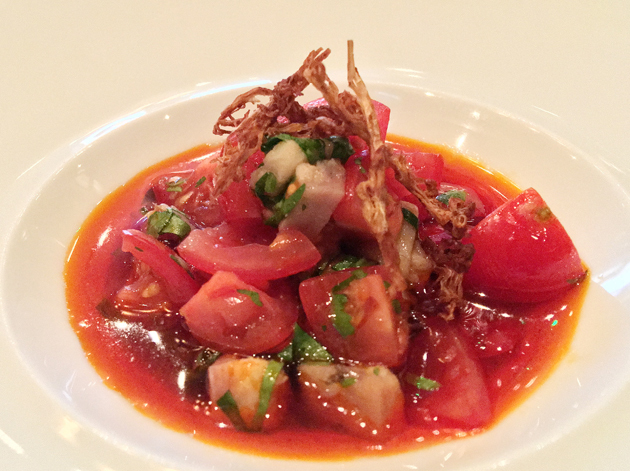 After the wondrous taro dumplings, the smoked eel with tomato was a bit of slow-burner but it too won me over in a big way. The umami tomato meshed well with the tingly chilli oil which packed an XO-like level of umami itself. The fleshy cubes of eel added not only another layer of moreishness, but had a smoky quality too that rounded out this dish wonderfully. 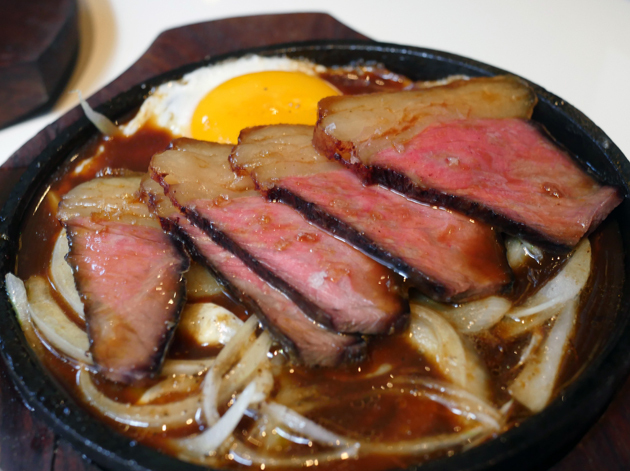 Just thinking about this dish is enough to make my lower organs flush with excitement. 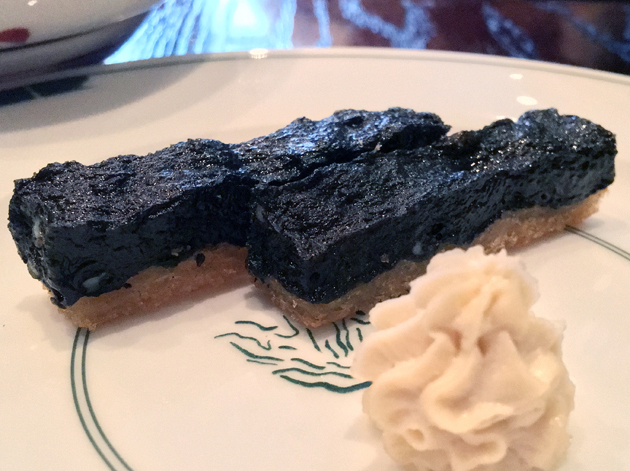 Cuttlefish toast was effectively a refined riff on the takeaway classic of prawn toast, with lightly springy and umami layers of deep black cuttlefish sitting atop toast soldiers. It was perfectly pleasant when taken with the taramasalata-esque fish roe, but I was left unmoved by it overall. If you hold more affection for classic prawn toast then I do, then you’ll probably be more enamoured with this reimagining. Not as black as my soul, but not too far off either. 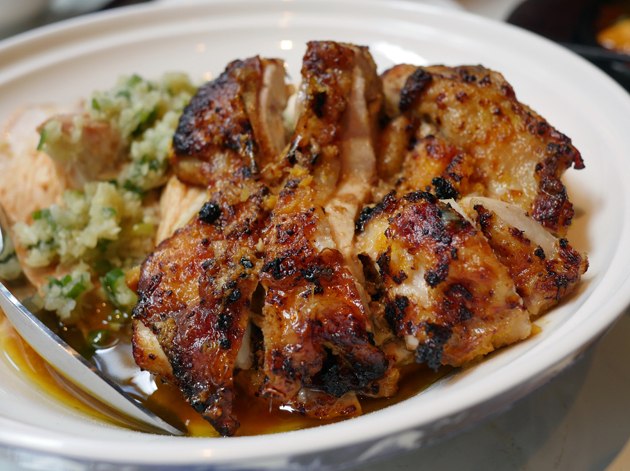 Although the shou pa chicken wasn’t served as a whole bird with the head still intact as the early PR had said it would be, this was still a sumptuous chicken dish. And that’s coming from someone who’s usually entirely unmoved by chicken dishes. 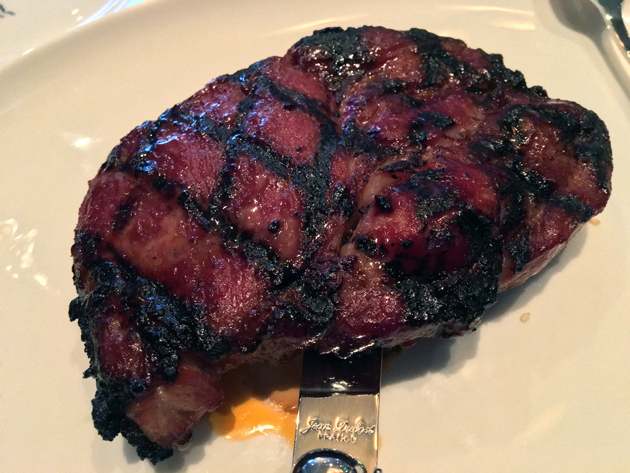 Moist meat came topped with skin that alternated between supple and crispy. Crispy crumbs of skin, served on the side for use as either a dip or a sprinkled garnish, added another layer of texture. 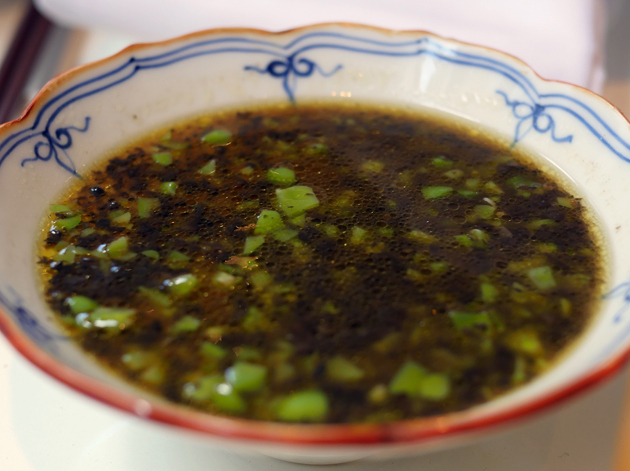 It was the moreish and classily understated ginger and spring onion sauce that made this dish though – a seemingly simple yet neatly sophisticated condiment that’s so integral to the lip-smacking enjoyment of this dish, that it’d be unimaginable without it. 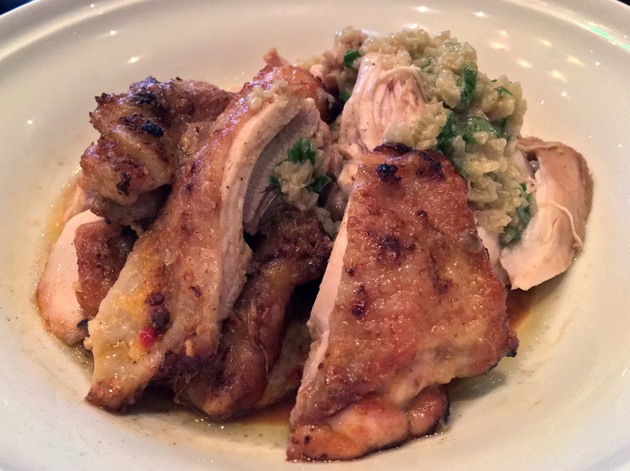 In very broad strokes, this dish reminds me of the riesling chicken at Islington’s Bellanger. 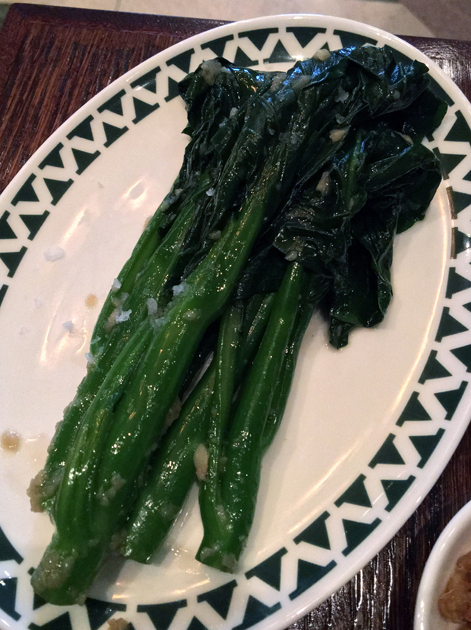 Gai lan came laced with confit garlic that provided an intense initial hit of heat. Even though that effect faded quickly, it was still just about bold enough to makes its presence felt throughout. That’s just as well, given the oddly artificial smokiness to the greens that I found somewhat intrusive. 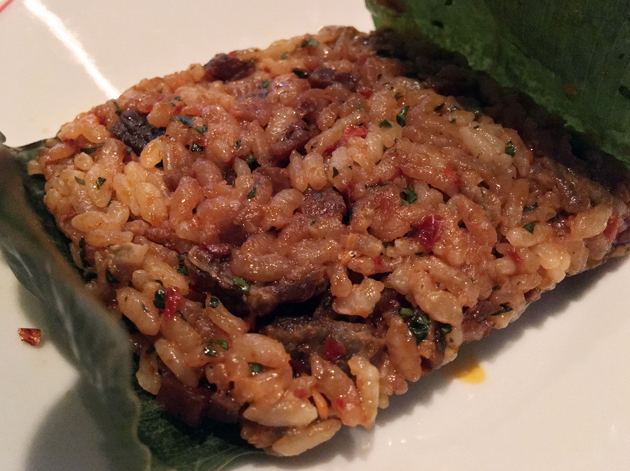 Lamb rice wasn’t just lamb rice. It was small soft-grained rice laced with a consistently bold earthy funk courtesy of small bits of flesh-on-the-bone, while a thin bed of mashed sweet potato provided a gentle yet unmistakable sweetness. Addictively scrumptious. The anti-sweet potato crowd isn’t going to like this. Their loss, our gain. 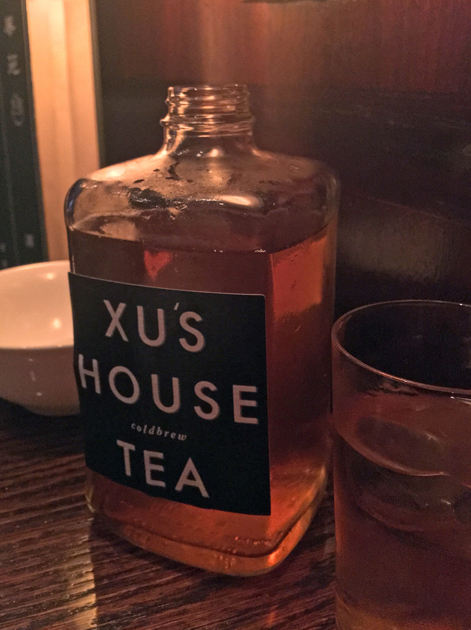 Xu completed its trifecta winning streak of iced teas with the longan and mandarin cold brew. The distinctive taste of longan imbued this refreshing drink with a fruity tone, underlying a pleasing resemblance to chrysanthemum. When I close my eyes, I can still feel the coolness of the glass’ condensation under my fingers. The 10 year aged oolong, served hot, was less successful. 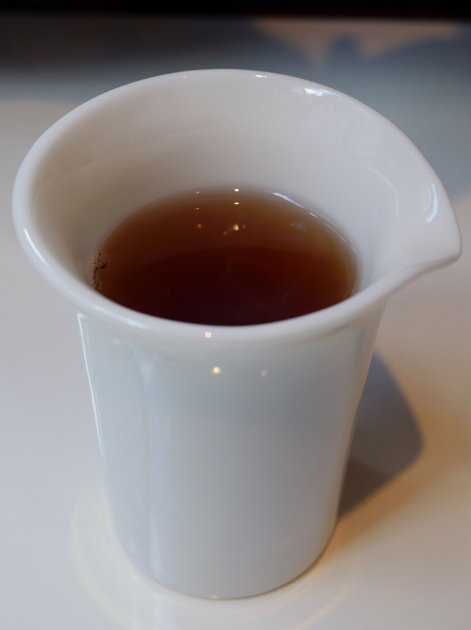 Apart from an initial peaty lilt, it struggled to stand out from other high-quality oolong teas. Hot water urn and tea pot just out of shot. 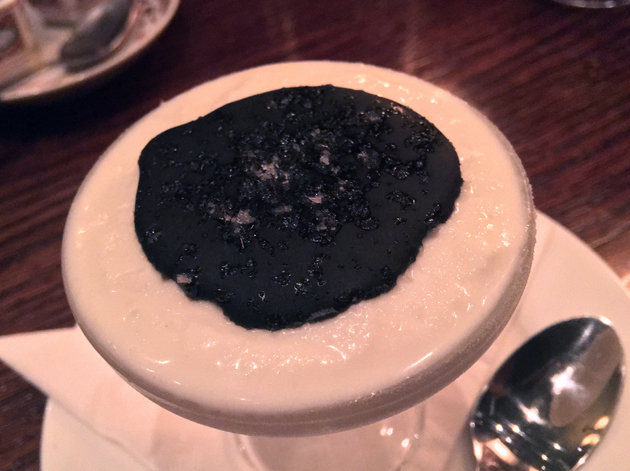 The steamed egg, a kind of savoury crème caramel if you will, was smooth and gently creamy. What really made it though was the brightly moreish and sprightly sauce. Here’s to the things you love. The Euro Hedgie, my dining companion for this third and final meal, wished that the XO carabinero prawns had a more pronounced springiness in their texture. I see his point, but I found the bounciness of the zingy fresh crustacean flesh eminently pleasing as it was. 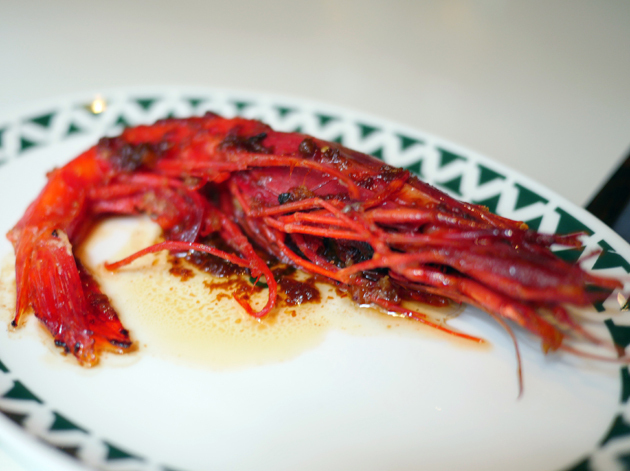 The prawns didn’t just rely on freshness and mouthfeel alone. 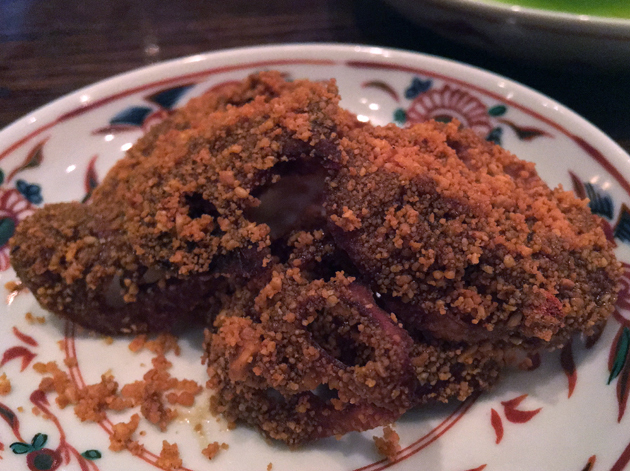 The tingly umami of the XO sauce was sumptuous and meshed especially well with the earthiness of the prawn’s head gunk. The Euro Hedgie’s modest objections aside, this is the sort of seafood that alleged specialists such as Rick Stein Barnes should be serving up if they were worth anything at all. £8 per prawn, but don’t see red. It’s money well spent. Truly, honestly, beautifully. Beef pancakes came in deconstructed form a la roast duck – you fill the thin pancakes with meat and veg yourself. 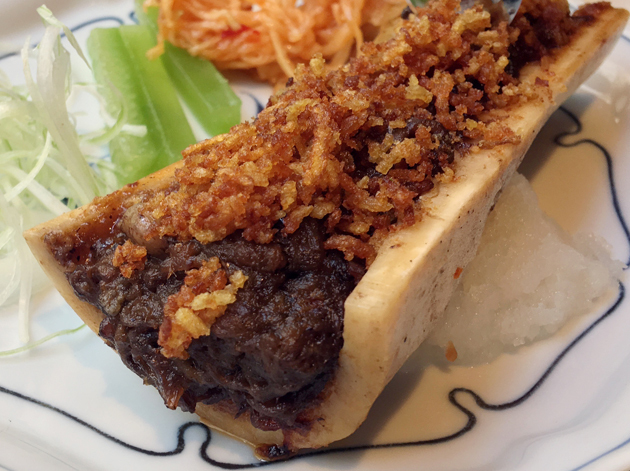 The meaty, umami and unctuous bone marrow and very finely ground beef was a meaty delight, even more so when taken with sweet and refreshing pureed daikon and spring onions. The pancakes got in the way of all that though, despite their seeming waif-like non-presence. Keep your pancakes. Just give me a spoon and a hunk of bovine bone and I’m happy. The shou pa chicken was just good as it was before, if not even a tad more moreish that it had been the first time around. The Euro Hedgie was almost totally silent while scoffing this chicken. It takes some cooking to silence the loquacious brat. The black pepper beef was as far removed from the gristly flank meat found in takeaways and high street Chinese restaurants as it’s possible to get. Tender medallions of flesh ringed with gelatinous fat had an utterly delightful beef tangy to them. 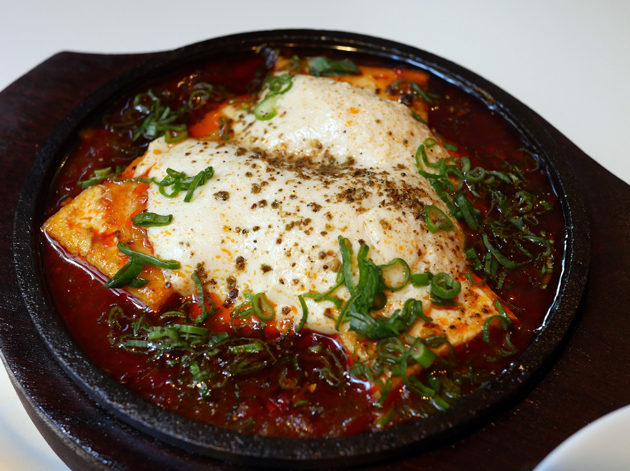 This was emphasised further by the double richness of the runny egg and the sauce dotted with onions. The sauce may have been thin, but the sumptuousness of its beefy tang exceeded that of any gravy I’ve ever had. As the Hedgie rightly pointed out, it’s not the best beef dish you’ll find in a city which has no shortage of superlative moo meat. Even so, you’d have to be a recalcitrant contrarian to come to Xu and not order it at least once. 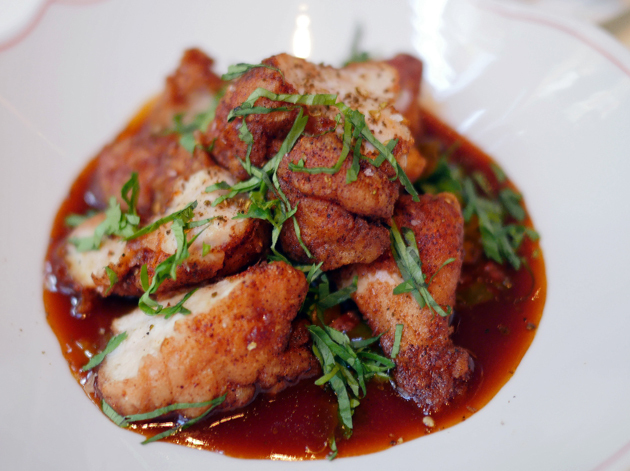 Lamb sweetbreads came dressed in a tingly and sprightly sauce that was easily the best thing about this dish. The offal bits themselves were too bready and didn’t the creamy gelatinous smoothness that I would expect. One or two of the photos here are a tad iffy. Apologies folks – technical problems in the field. Xu’s reimagined take on mapo tofu divided opinion. While the Euro Hedgie found it to be a tad too sweet with not enough citrusy heat, I couldn’t disagree more. 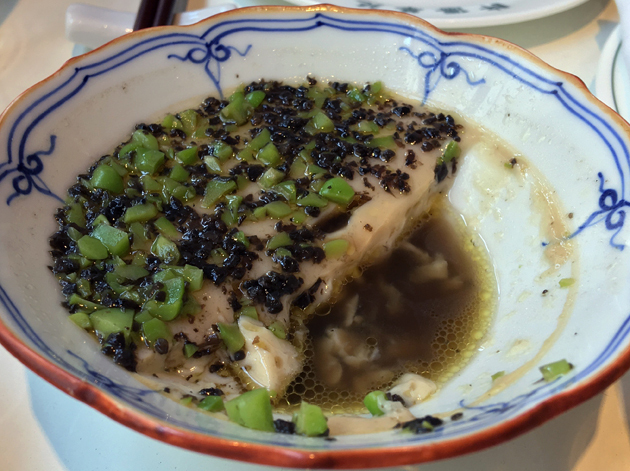 While it was certainly lacking in the numbness I’d expect from a dish incorporating Sichuan peppercorns, its moreishness and citrusy heat made it a delight. This was especially the case given the two types of tofu used- squidgy and almost ethereally wispy silken tofu and heartier, firmer pan-fried tofu. More classical versions of mapo tofu use only one or the other. The textural variation and generally accomplished sauce made this dish a winner as far as I’m concerned. Not your pockmarked grandmother’s mapo tofu. I’m not usually a fan of congee, but Xu’s congee is a very different beast from classic versions of this rice porridge. Arborio-style small grained rice provided a firmer bite, while the seeming use of chicken stock meant that this was not the thin and watery gruel that I usually dislike so much. 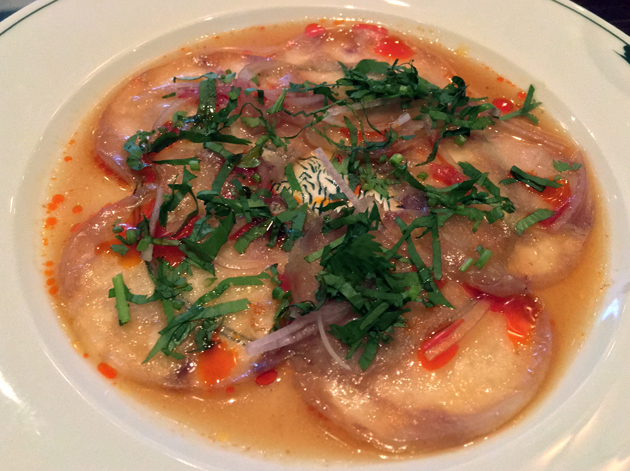 It was much richer and heartier, with taro providing a hint of starchy sweetness. 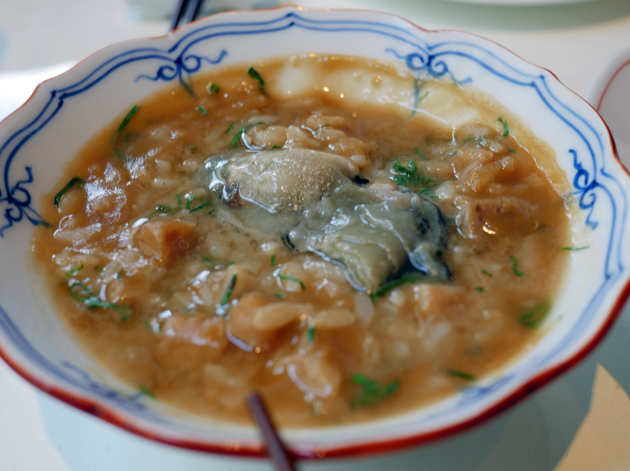 It may be closer to a risotto than a congee and the lone oyster was neither here nor there, but this is still a congee that I can get behind. I didn’t intend to return to Xu only a few short weeks after publishing this review. But a last-minute summons from the Euro Hedgie, left high and dry by his original dining partner, led to an impromptu light supper. The timing was unexpectedly fortuitous – Xu has been gotten mixed reviews in some of the national and London papers. While I’m almost always certain in my Verdicts, it would be hubris and folly to ignore the views of others and dismiss the possibility that I’ve missed the mark. But I needn’t have worried – the naysayers are still wrong about Xu. 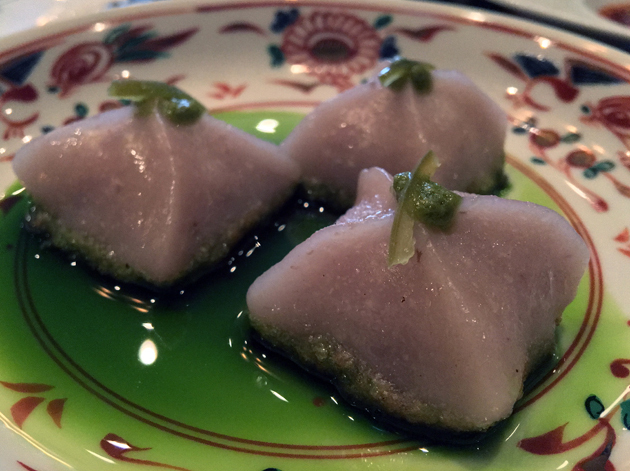 One dish that the naysayers seem to find befuddling or disagreeable is the taro dumplings. While I found the springy-yet-soft texture utterly beguiling on my second visit, others apparently did not. Unfortunately, Xu’s kitchen appears to have taken this misguided criticism to heart. The dumplings this time around were not only a bit smaller, with a proportionally shrunken and thus less satisfying amount of filling, but were also noticeably firmer. 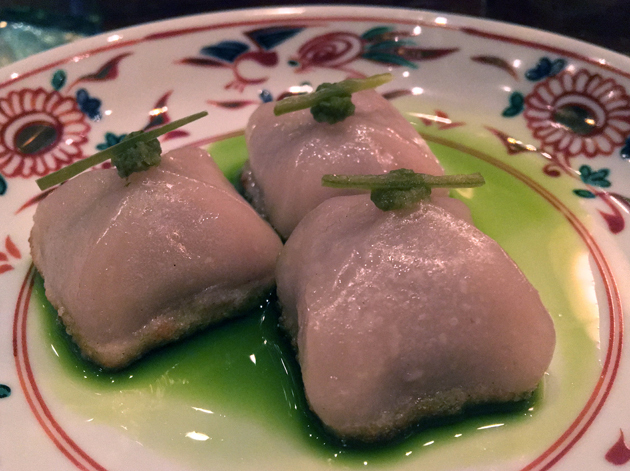 Although still far from bad, these dumplings were no longer as exemplary as they once were. Sometimes a firm hand isn’t the right approach. Root vegetable crisps smothered in a dumpster truck’s worth of togarashi-like spice dust wasn’t bad, just deeply uninteresting and monotone. I’d rather have salt and vinegar. Or maybe those squid-flavoured ones. So far, so humdrum. The meal only really started to come alive with the chilli egg drop crab. The crab head meat and sleeves of egg took a back seat and acted as a protein backdrop for the umami and the heat of the garlic and chilli sauce. 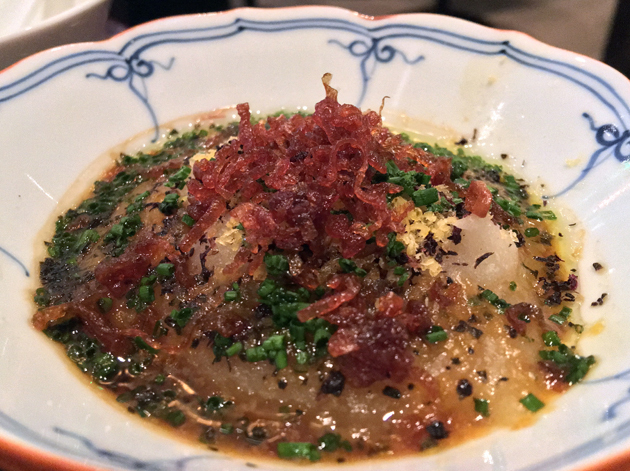 Unexpectedly, this warming scarlet blanket meshed beautifully with the oily richness of the cod roe – so much so that I almost wished for more cod roe and less crab. 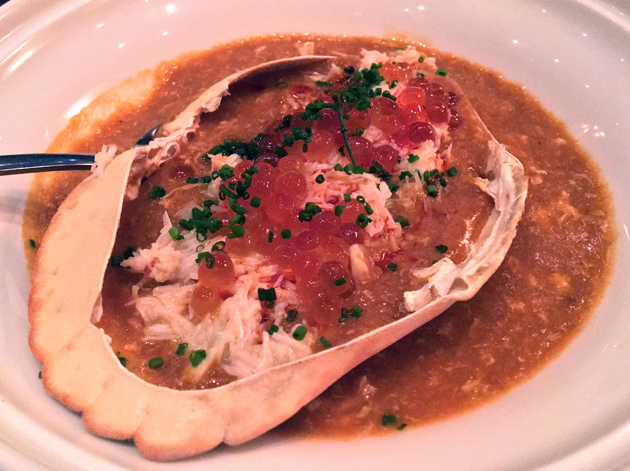 It would be a crime not to pair the egg drop crab with the lardo onion rice. 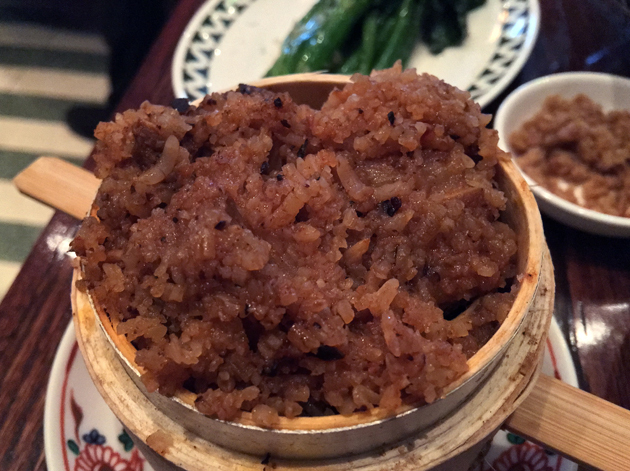 Small-ish sized grains of moderately firm rice came topped with caramelised onions and, more importantly, lusciously corpulent yet nubile and gently yielding discs of lardo. It enriched the already sumptuous egg drop crab to a perversely beautiful degree. Firm-ish rice is a departure from the soft and fluffy rice I usually associate with Chinese cuisine. I’m not usually a fan of vermicelli, but the thin transparent noodles here proved to be a fine conveyor for slithers of tart and earthy fungus. 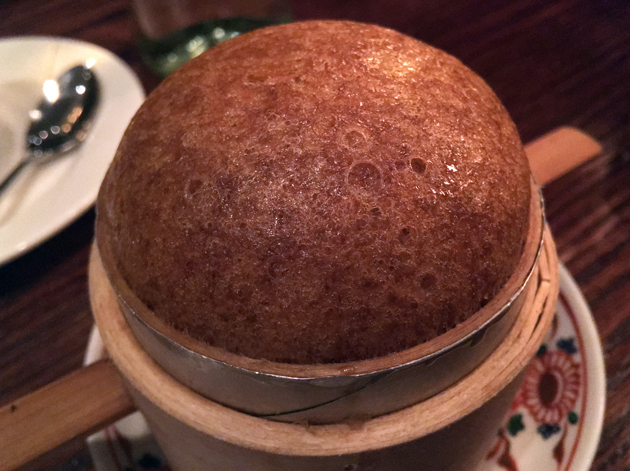 Sponge cake, similar to the type from a Hong Kong café, was light, airy and reasonably moist. Its neutral taste made it a good way of transporting the brown sugar-based richness of the butterscotch sauce into my maw. Although the condensed milk wasn’t as viscous as I expected and was more milky than sweet, it still had its place. When mixed together with the butterscotch, it became silky smooth with a delicately orange-like tilt to it that was subtle yet nonetheless satisfying. Butterscotch and condensed milk just out of shot. The salted sesame ice cream was a game of two halves. The smooth, airy ice cream had an exceptionally clean and crisp after taste. Unfortunately, the congealed disc of salted black sesame up top was grimace-inducing in its excessive saltiness with very little of the distinctive nuttiness I’d expect from sesame. Occasionally, matters really are a case of black and white. 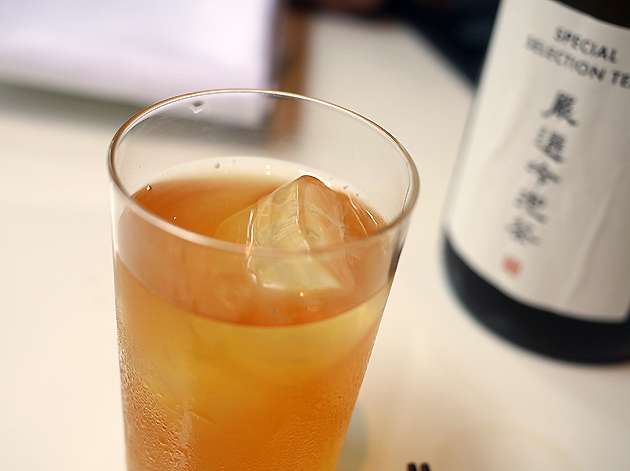 The house cold brew iced tea was just as good as it was before – crisp and clear with a honey-like sweetness. That label seems a bit excessive. Despite some noticeable wobbles and regressions, enough remains soul-soothingly right at Xu that I stand by original Verdict. I once declared the Fitzrovia Bao to be the unassuming exemplar of contemporary Chinese cooking in London. While that isn’t an exclusive garland and I still stand by that statement, in hindsight I kind of wish I had reserved that accolade for Xu. It’s important to point out that Xu isn’t really traditional Taiwanese. It’s not cheap either – this is fine dining, but without the tablecloths and formality. There are also a few niggles here and there with a handful of the dishes. But it’s a testament to Xu’s verge, vigour and understated culinary confidence that such things can be easily overlooked. There are very few other restaurants in London I’d rather eat at. It’s as simple as that. Opening Hours: Monday-Thursday noon-15.00 and 17.00-23.00. Friday-Saturday noon-23.00. Sunday noon-22.00. Average cost for one person including soft drinks and service charge: £65-70 approx. Tags: bao, beef, char siu, chicken, cuttlefish, dumplings, eel, foie gras, iced tea, jerky, lamb, london, milk, pancake, papaya, pork, restaurant, review, rice, smoked, taro, toast, tomato, xu, yam. Bookmark the permalink. Sounds amazing but I think their presentation lets them down a bit for a 5* restaurant. I don’t think that matters at all.